Alright, the latest in ID's is finished! I drew this in class on Friday. Because I wanted to draw a pig. Originally it was going to be a boar, like it always is, and originally it was going to be a really large boar. 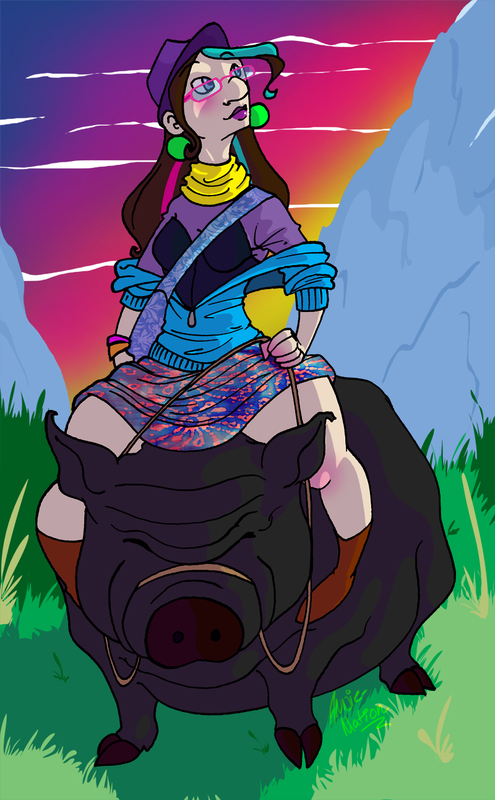 Basically I was going to be riding Baeddan- but instead I drew a squat pot bellied pig. Because I freaking love their wrinkly faces. I enjoy how if I were to get off my steed it would probably stand to my hips. Waist, at best. Still very very large for a pig though, haha. Psht, horses. Who needs horses? Don't get me wrong, I love horses too. Originally I was supposed to be holding some sort of weapon, and riding my big all battle ready- but let's face it, I couldn't think of a weapon I could actually see myself holding, so it turned from epic, to cute, in a span of "she's supposed to be holding something-"
Alas. I'll just ride my steed to school. I made the background just by having some fun with the lasso tool in photoshop. I based it off the highlands I visited while in Scotland. I probably should have added some Scottish heather. Hm. I might go back and add that. Anyways! 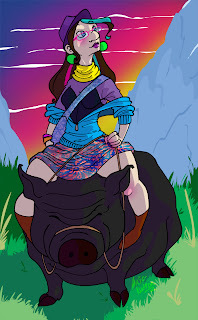 Me, the pig rider. It's all you all right. Very cute and colourful.